Urevent HD is constructed with oil resistant, low temperature Ether polyurethane (TPU) and a steel wire helix which provides a higher service temperature range of -65°F (-54°C) to 225°F (107°C). 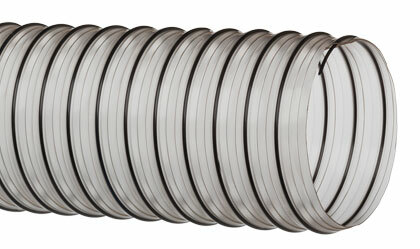 The helix wire can also be grounded for static dissipation. The hose’s FDA, phthalate free transparent heavy duty construction, allows for visual confirmation of material flow. Urevent™ HD Clear is designed for wet or dry abrasive applications such as dust control, insulation blowing, woodworking dust control, pharmaceutical product transfer and food grade material handling. Click here for more info.